PlayStation VR game coming west soon? The Pan European Game Information board has rated The Idolmaster: Cinderella Girls Viewing Revolution for PlayStation 4. 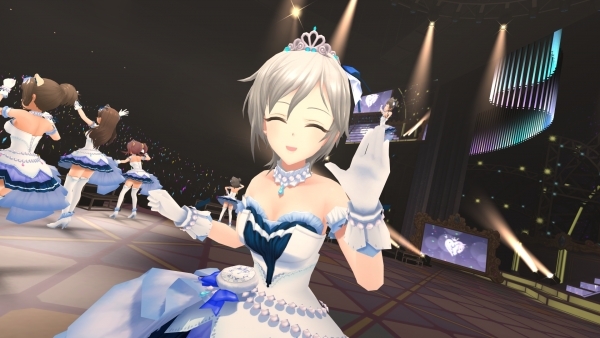 The PlayStation VR game, which launched in Asia with English subtitles in April and was rated in Germany in February, is set at the Maihama Amphitheater, where the Cinderella Girls’ first concert, “The Idolmaster Cinderella Girls 1st Live Wonderfull Magic,” was held. It features nine idols and three songs: “Onegai! Cinderella,” “Star! !,” and “Yes! Party Time! !” Players will be able to choose from a range of concert light colors to go with the music.